EtryBest introduced high Tech 4 in 1 lens kit to capture the small objects or wide range from long or short distances. Perfectly work with most of smartphones, ipads, tablets and laptops. Due to this amazing kit you can capture the world’s beauty which you didn’t saw ever before. Online shopping in Karachi, Lahore and Islamabad etc. Impress others by your photography skills and shoot the every memorable moment of the event with this multitasking outstanding lens kit. √ Four Great Lenses in One Kit: To discover the beauty of the virtual world, use this 4 in 1 lens enables you enjoy all kinds of photography and capture every wonderful moment! Telephto Lens can shoot the scene within 300 meters very clearly applied to any smartphones; Macro lens can take clear photos of small objects; 0.67 Wide-angle lens can shoot larger range of scenery; 180 degrees of the scene can be captured by Fisheye lens, which can let you enjoy the unreal world. √ Wide angle and macro lenses in a 2 in 1 set: These two small lenses are screwed together for easy storage. To use the wide angle, simply attach both lenses to the case provided. To use the macro lens, simply unscrew the wide angle lens. 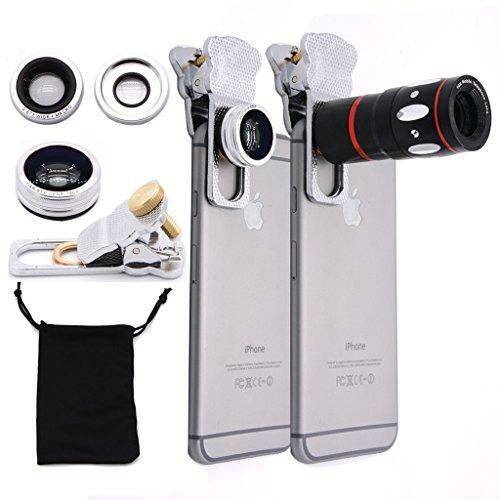 √ Wide Range of Uses:Universal lens clip can apply to iPhone 6 Plus, 6 , 5, 5S, 5C, 4S, 4;HTC; Samsung Galaxy S5, S4, S3; smart phone and many more. It also can be used on IPAD, TABLET PC,and LAPTOPS..
√ High-quality Optical Glass and Aluminum Construction:It can strengthen the durability of the lenses and make the screen better. √ Sold exclusively by EtryBest, quality guaranteed.